Dear Friends and Neighbors, Please consider donating or volunteering to help those affected by recent disasters. Please click HERE for more information on how you can help. Want to find out about Mistletoe Heights history? You should probalby start HERE. If you have additional historical information to share or would be interested in helping in any way, please contact our historian Luke Ellis at lellis@belaw.com. Current and back issues of our monthly newsletter can be found HERE. Neightborhood news, additional stories of neightborhood history, advertisements for local products, contact information, and much more can be gleaned from the pages of the Mistletoe Express. 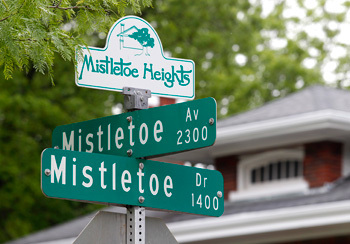 We also have a page a Nextdoor.com, "The private social network for neighbors in Mistletoe Heights". Click Nextdoor Fans to get started. Pictures, pictures and more picture can be found at this link Gallery. There are photos of all the houses in the neighborhood. Some historical photos can also be found. Did you miss the last holiday celebration? Look no further. Don't forget to scroll down, there are lot's of pictures.